Dr. Luiza Petre is a Board Certified Cardiologist and Weight Management specialist with extensive training and experience. Dr. Petre currently is appointed Assistant Clinical Professor of Cardiology at The Mount Sinai School of Medicine, Cardiology Clinical Instructor at NYU Langone Medical Center and is an active Fellow of American College of Cardiology (FACC). She has been in private practice since 2007 with a focus on Cardiac Imaging and Weight Loss/Lifestyle Modification as the most effective Preventative Cardiology approach. Dr Petre is telling us all about the diet plan to help you reach those New Year’s resolutions. Megyn Kelly talks about Intermittent fasting along with TODAY nutritionist Joy Bauer and weight-loss expert Dr. Luiza Petre. Intermittent fasting is a new frame to incorporate a weight loss program like the Medi-weightloss®. Weight loss expert Dr. Luiza Petre explains how to lose weight and keep it off! The Medi-Weightloss® Clinic in Eastchester has helped clients drop a total of 15,000 pounds in four years. 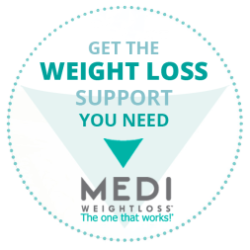 The Medi-Weightloss® Program is not just another diet – it’s a physician-supervised and clinically-proven approach that helps our patients achieve and maintain a healthy weight†. Our professionals focus on preventive medicine. After medical tests and in-depth consultation with each patient, our medical staff creates an individualized and comprehensive plan for each patient. Did you know that being affected by overweight and obesity can impact your health? Losing weight can reduce your risk of developing many health conditions. is a physician-supervised three-step weight loss program designed to help you loss weight quickly and keep it off. Set Up Your Weight Loss Consultation! We have a Signature Patient Website to help you and to keep track of your weight loss progress. Also part of our program is the Tanita scale, which measures your body composition and The ReeVue™ metabolic test which measures resting energy expenditure. Our Signature Supplements and Products contain only the highest-quality ingredients and are specifically designed with proprietary formulations that supply the nutrients you need to help you achieve and maintain your ideal weight. Health problems, such as diabetes and cardiovascular disease, require the specialized care of a healthcare professional. This is why one- size-fits-all approaches to weight loss and weight maintenance often don’t result in long-term success. (Jensen et al., 2013). Our program is based on weekly visits where we do body composition analysis, complete medical exam (including blood panel and EKG) and even more, we educate our patients about nutrition and fitness. We are a physician supervised weight loss program where we offer a balance of education, appetite management and exercise activity to lose weight. We teach you strategies to keep weight off using real food. Over 3 million pounds lost since 2006. Our patients are thrilled to tell the story about their weight loss journey. Find inspiration and motivation to join them on the path from before to after here! Overeating doesn’t make you fat. Rather, it’s an excess of high glycemic foods like sugar and refined grains. to achieve my goals & better understand my body. treat you with the utmost respect and so supportive and motivating. and helps course correct when I have issues with maintaining progress. I'm a regular patient and every visit I'm greeted by the staff in a warm, engaging way. The facility is clean, professional & organized. Dr. Petre is knowledgable & professional. She cares about the health and wellness of her patients. She has hired top notch staff to monitor and interact with patients. Will and Annelie are both assets to her practice and create an encouraging atmosphere. Excellent support through my personal weight loss journey. † Results may vary from patient to patient. Rapid weight loss may be associated with certain medical conditions and should only be considered by those who are medically appropriate.